Nestled on the beachfront between tropical palms, the Uprising Beach Resort offers adventure, relaxation and sheer natural beauty all in one stunning location. Situated near the beach in Nadi, this hotel is close to Garden of the Sleeping Giant and Wailoaloa Beach. Area attractions also include Sabeto Hot Springs and Mud Pool and Sri Siva Subramaniya Temple. Volivoli is a wonderfully relaxed beach resort located in a truly unspoiled and spectacular corner of Fiji where life is simply sun, fun and water sports. The perfect spot for scuba divers. Paradise Taveuni is a boutique resort positioned on 5 acres of oceanfront land with a unique deep-water frontage, perfect for couples and families looking to explore the great Somosomo Strait. The Namale Resort & Spa in Savusavu is Fiji’s number one 5 star luxury boutique resort offering a pristine sanctuary of peaceful seclusion, romance and luxury. The Koro Sun Resort & Rainforest Spa is located in a remote setting that defines paradise, immersing you in a genuine Fijian experience that’s nirvana to the core. The Qamea Resort and Spa is an exclusive tropical destination for discerning travellers seeking a truly unique and authentic Fijian experience without sacrificing luxury or service. If you’re looking for a true Fijian dive holiday then Wananavu Beach Resort is where you want to be spending your time relaxing in a paradise luxury bure accommodation. 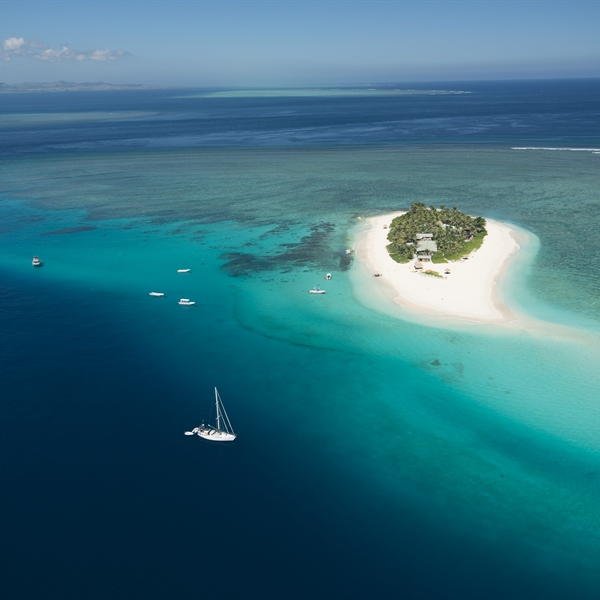 The best way to dive Fiji is on a liveaboard as you can see much more than staying at a island resort. If you have time/budget we recommend mixing the liveaboard with a few days on an island resort. NAI'A offers the best of world class scuba diving at an unrivalled variety of sites with Fiji's & Tonga’s finest diving and all the creature comforts of a quality land-based resort. Just an hour from Pacific Harbour in Suva City you'll find the stunning botantical Thurston Gardens. Cruise and watch the wonders of Fiji's islands go past while you enjoy this scenic cruise. Savusavu is surrounded by mountains, rivers and waterfalls. Thermal mud pools here are created from the ancient seam in the earth's surface creating these thermal and muddy natural pools. In the heart of the tropical rainforest, just 25 minutes from Pacific Harbour Fiji’s ‘Adventure Capital’, lies ZIP FIJI’s private eco-reserve - a biological paradise! Our highly-trained guides help you use special equipment and techniques to experience this amazing wilderness from a unique perspective. From passages to seamounts, great walls to pinnacles and channels, when diving Fiji’s Blight Waters you can be sure of a great diving and varied experience. 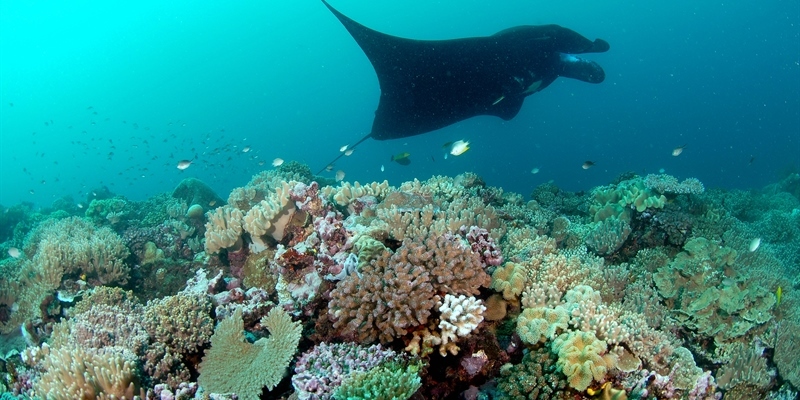 Beqa just off Pacific Harbour and Kadavu Island offer the perfect blend of great wall dives combined with the famous shark dive and terrific encounters with majestic manta rays. The Great Sea Reef in Northern Fiji is best for specialist and ecologist divers who appreciate the unusual fish and macro invertebrate life on inner reefs, around mangroves or dramatic walls and passages. The place where magical Islands, beautiful people, endless beaches, azure waters and happy faces await you. Fiji offers something for divers of all abilities. Known as “The Soft Coral Capital of the World” the reefs are in an exceptionally healthy state with hard and soft corals, gorgonian fans and crinoids making the reef burst in colour. Fiji is hands down a favourite for the Ultimate Diving team! The coral reefs that surround the islands are some of the most colourful and vibrant that we have seen. Being the world's second largest coral reef you will have some very busy dives with up close and personal encounters with a myriad of small tropical fish, mantas and sharks. Diving in Fiji is absolutely amazing and an experience not to be missed. The Fijian Islands have some of the most untouched, diverse and gorgeous reef ecosystems on earth. Whether you are a certified diver, want to learn to dive or have a non-diver partner, Fiji offers something for everyone. Known for its palm-fringed beaches, cascading waterfalls, lush rainforests and of course a spectacular underwater world teeming with vibrant fish and colourful corals, Fiji will give you and your family an adventure of a lifetime. Fiji belongs to the Oceania group in the South Pacific lying about two thirds from Hawaii to New Zealand. The archipelago consists of 332 islands, 110 of which are inhabited. The two main islands are Viti Levu hosting the capital city of Suva and Vanua Levu home to the greatest Somosomo Strait. Islands like the Lau group, Kadavu, Taveuni, Nairai,Beqa, Namena, Qamea and many others surrounding the Koro Sea make up the Fiji Islands. Dive sites in Fiji are exciting and varied with sheer reef walls and pinnacles rising from 900 metres to the surface shallow sunlit coral gardens and current-flushed channels. Each location has a unique mix of topography, weather patterns and special attractions. You will have the best time if you select the type of diving that suits your experience level and personal interests. Being the world's second largest coral reef, Fiji waters are covered with bright coloured soft corals and gorgonian fans, intriguing caves and swim-throughs as well as spectacular drop-offs that will keep your underwater exploring experience busy for a few weeks. Rated one of the top 10 dive destinations in the world and also known as the “Soft Coral Capital of the World”, Fiji’s underwater topography and coral formations attract a wide variety of marine life. Expect to see large schools of small tropical fish, blue and gold fusiliers and anthias swelling the reef around divers, big aggregations of barracuda swimming over the reef, sharks gliding in close, blue-ribbon eels peeking out of the reef as well as five of the world’s seven species of marine turtles. 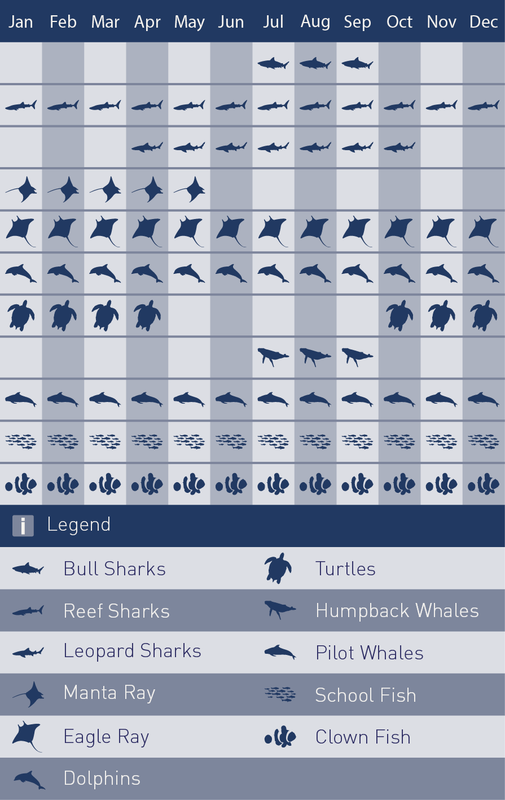 The local warm waters are also an important migratory route for twelve species of whales including humpback whale, sei whale, blue whale, sperm whale and pilot whales. 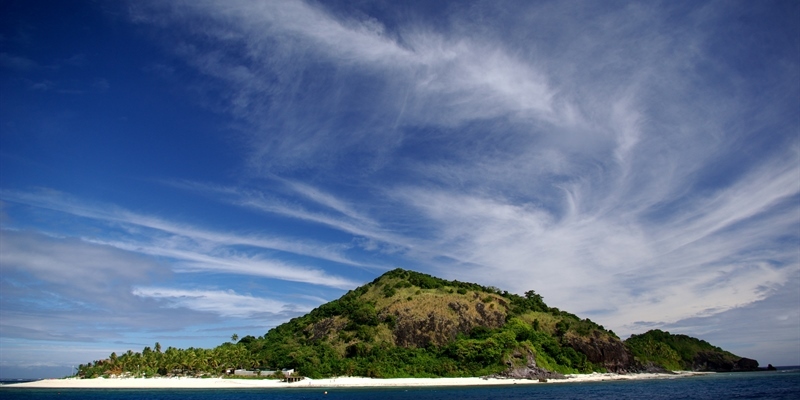 Namena is the mecca of a Fiji diving experience. Namena Marine Reserve is a protected area around Namena Island and the surrounding horseshoe-shaped barrier reef locally managed by the ten village chiefs. Although part of a sea area where customary native fishing rights still exist, you are guaranteed to be diving in unspoiled crystal-clear waters and experience close encounters with schools of barracuda, sharks, trevalis and thousands of fish and invertebrate species. The park is home to more than 1,000 species of invertebrates, 400 known corals, 445 documented marine plants and over 1,100 fish species. Not only that, the area is also a migratory pathway for pelagic which means you might have the opportunity to see some really special creatures passing through such as the bottlenose and spinner dolphins or pilot, minke, sperm, and humpback whales. A day trip to the Somosomo Straight to explore the amazing Rainbow Reef is a must when diving the Northern Fiji region. Most dive operators will include a trip to one or two of the many diverse and extraordinary dive sites along the thirty kilometres long reef boasting multi-coloured soft corals as well as stunning hard corals. The reef is home to majestic manta rays, schools of barracuda, white tip and leopard sharks and close encounters with migrating pilot whales. Dream House in Savusavu is world famous in Fiji for pelagic encounters. 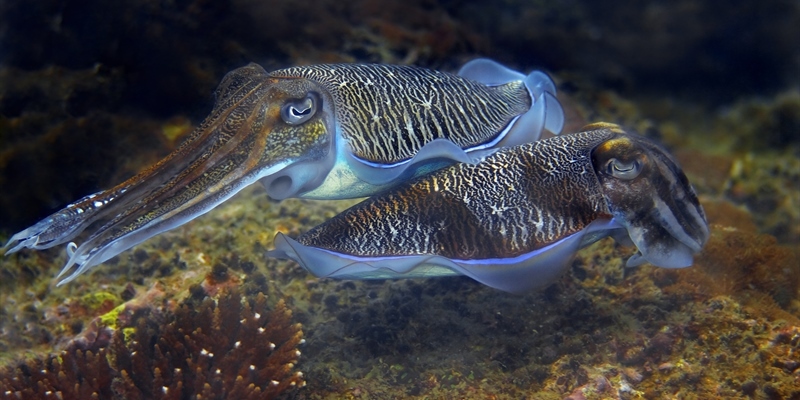 Dream House is the dive site you want if you want to encounter scalloped hammerheads, grey reef and white tip sharks, barracuda, bat fish, surgeon fish, unicorn fish, tuna, scorpion leaf fish, anemone fish and popcorn shrimp on adhesive anemones and maybe even silky sharks. If you are a lover of sharks you cannot go to Fiji and not dive ”The Arena”on the fringes of Beqa Lagoon . In 1999 Brandon Paige, also known as the “Shark Whisperer” created a dive with the intent to educate divers and aid in the conservation of sharks. Today this dive has become the world’s number one shark dive. Just imagine yourself swimming through schools of groupers, jacks and snappers and all the sudden you are approaching a mix of up to eight different species of sharks including sicklefin lemons, tawny nurses, silvertips, grey reefs, white tip and black tip reefs sharks as well as the amazing and intriguing bull and tiger sharks. The reality will be you taking part on the ultimate shark encounter and making a dream come true. The Great Astrolabe Reef surrounding the north and north eastern half of Kadavu Island is rated one of the world’s premier diving locations. 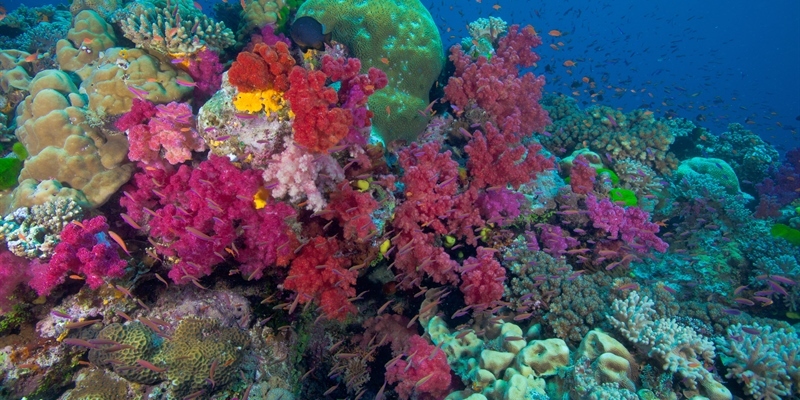 The reef is about 100km long, making it the fourth largest barrier reef in the world. Here you will get to dive some of the world famous dive sites including Naiqoro Passage, Vessi Passage with Waisomo Reserve. The reef boasts a variety of stunning hard coral, colourful outer reef slopes and some steep coral drop offs. Mellow Yellow is named after the large population of yellow soft corals trees decorating the current facing side, a favourite to all visiting divers. When the current isn’t running the soft coral can be rather limp, but add a little current and this dive is one you do not want to miss out on. Here you will get to see schools of scalefin and colourful anthias that are so thick you will not be able to see through them. But don’t get hung up on looking just at the schooling fish, check the cracks and crevasses for small shrimp, nudibranchs, scorpion fish and other macro life. Nigali Passage is a narrow cut in the surrounding barrier reef which concentrates pelagics from miles around. Nigali is home to female gray reef sharks numbering from eight to twenty five depending on the season. The channel is also home to huge schools of trevally, three age-segregated schools of barracuda, big flowery cod and a massive concentration of snapper. While you drift past the marine life hanging in the current you may be very lucky and see eagle rays, manta rays and hammerheads! While in Fiji you will hear the word “Bula” all the time. “Bula” can mean many things depending on the occasion; it can be used as hello or welcome, cheers or good health. You can be guaranteed that “Bula” will be received or delivered with the biggest and warmest smile you will ever see. Fijians like to be happy and go the extra mile to make you happy too which means you will always be entertained no matter what part of Fiji you are staying in. In the evenings most resorts invite local community groups and its chiefs to perform traditional dances and songs. On some nights you will experience Fiji’s traditional ceremony drink called “Kava”. The drink is made from the pounded roots of a local pepper plant mixed with water and drank in a communal coconut shell in a ceremony where everybody is sat on the floor around the “tanoa bowl”. The Fire Walking ceremony, an ancient Fijian ritual is also performed for visitors. During the performance the fire walkers walk in a single line across a pit of red-hot stones a few meters in length and amazingly their feet are unscathed after two weeks of preparation. Your Ultimate Diving travel adviser will help you choose the best board basis options available in the resort of your choice but just to give you an idea of costs in resorts and hotels in Fiji, the average cost for breakfast is $12.00 (£4), lunch is $18.00 (£7), dinner is $30.00 (£12), bottle of wine is $28.00 (£10) and a beer is around $8.00 (£3). Internet is also available but at an extra cost, depending on the resort you are staying you will be charged $5.00 (£2) for 30 minutes of internet. Please note that prices stated are only an estimate and can change from time to time. The above values are stated in Fijian dollars. Confirm primary courses and boosters are up to date. Advised courses and boosters: Diphtheria; Hepatitis A. Other vaccines to consider: Tetanus; Typhoid; Hepatitis B. Tipping is not customary or encouraged in Fiji. Everything is shared therefore tip with a smile and ‘Vinaka’ which is Fijian for ‘thank you’. 10 hours and 30 minutes on a British Airways flight from Heathrow to Los Angeles followed by 10 hours and 30 minutes from Los Angeles to Nadi. Flight schedules to Los Angeles allows for same day connections. There is a layover of 7 to 8 hours in LA. The Ultimate Diving team can arrange your stay at ReLAX lounge where you can enjoy complimentary refreshments, snacks and wireless internet. 20KG hold plus up to 7KG hand luggage. When flying between islands with Pacific Sun you are allowed 20KG hold luggage and 1 piece of hand luggage. Please note that some of the island hopper planes are very small therefore extra luggage is not allowed. Please also be advised that when checking in you will be required to step onto the scales holding your hand luggage. Our packages include transfers on arrival and departure day. On arrival you will be met by one of our representatives and transferred to the resort. 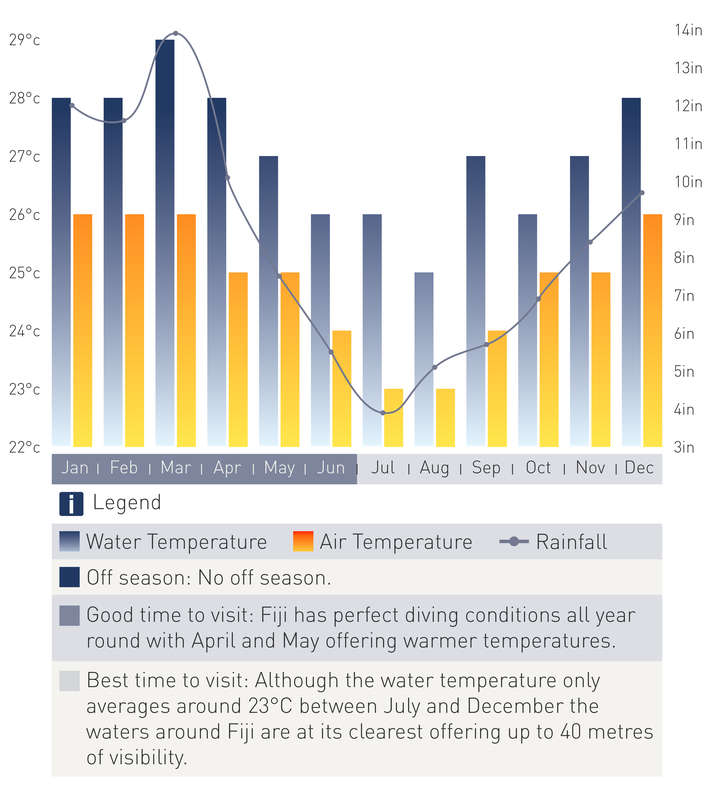 Fiji enjoys an ideal South Sea tropical climate making the perfect diving destination for those trying to escape severe winters. During the summer, from December to April the maximum temperatures average between 22 and 33 degrees Celsius. During the winter, from May to November the maximum temperatures average between 19 and 28 degrees Celsius. Qamea Resort & Spa - Stay 7 nights and pay for only 5 nights. Check out this Early Bird Booking Special offer: Stay 7 nights at the Qamea Resort & Spa and pay for only 5 nights. Not combinable with any other offers in the market – conditions apply. Stay 7 nights and pay only 5 plus free return tranfer! For over 30 years, each Aggressor yacht has offered 25% off. Dive the World weeks to reward guests. These weeks are announced once a year and get booked up early. Give us a call today and book your space. Single supplement available - based on full retail rate. Non-diver rates and multiple vacation discounts not available on DWC weeks. Not available for group reservations. Dates: 05/01/2019 to 12/01/2018 or 02/11/2019 to 09/11/2019. Save £100 when doing a stopover at this hotel. Book a full package with Ultimate Diving and save £120 off your holiday! Save £100 when booking with Ultimate diving a full package! Paradise Taveuni discount – save £150 per booking when booking with Ultimate Diving! Offer only valid for new bookings. Want a holiday of a lifetime? Look no further… this is the perfect opportunity for you!